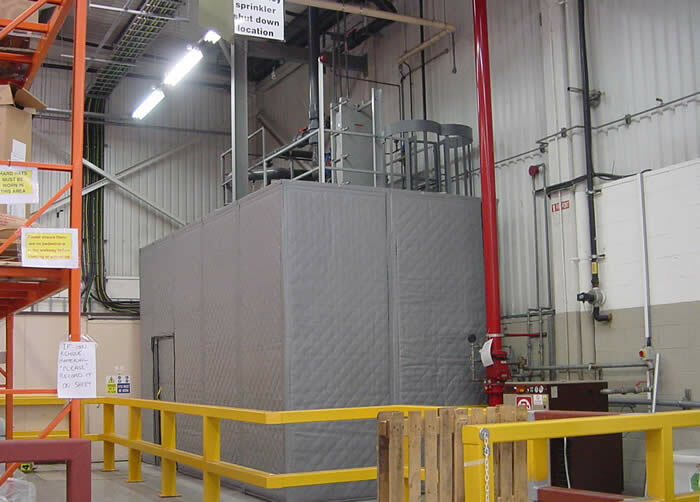 The Acoustic Curtain is an acoustic composite designed for industrial use and manufactured from sound absorbing fibreglass insulation and a polymeric sound barrier with absorptive and sound blocking elements encapsulated within an extremely tough vinyl covering. 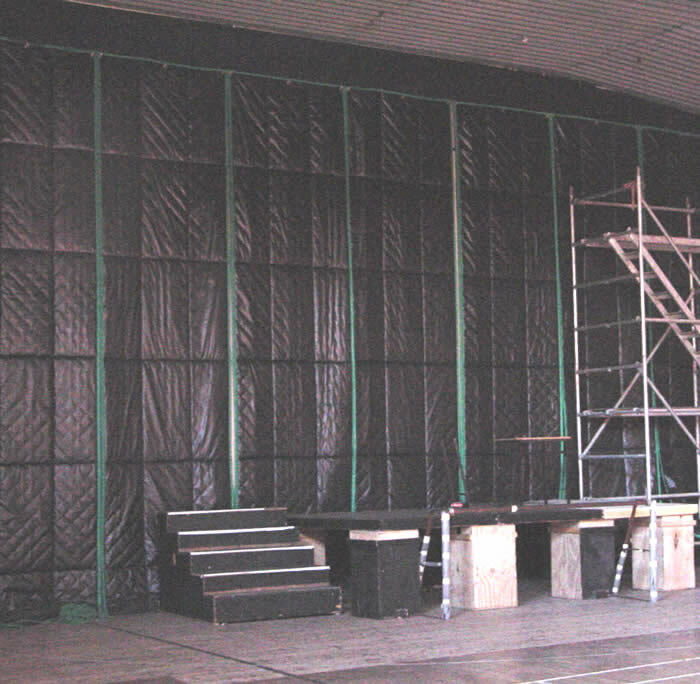 Acoustic Curtain is a very effective sound blocking curtain that can be used to screen noise around noisy machinery or simply used as a temporary solution to screen noise being generated when any noisy remedial work may be conducted. 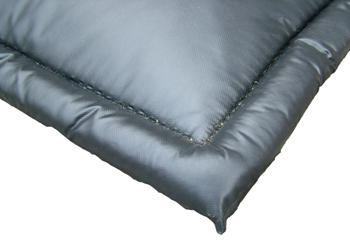 and each layer of insulation is quilted to enhance its durability. A 2kg/m² sound blocking polymer based synthetic membrane is laminated within the fibreglass layers. This membrane acts as a sound or noise barrier, thus reducing the transmission of noise through the curtain. The insulation is faced with a tough vinyl facing comprising a cloth coated in PVC rubber on both sides. The vinyl facing is wrapped around the edges of the composite and stitched to ensure the fibreglass insulation and polymeric barrier are protected from its working environment. The vinyl facing is designed for continuous use at temperatures up to 120°C and is available in black or grey. The curtains are highly flexible and can be supplied with various fixing options including eyelets and Velcro for installation. Acoustic Curtains for use in thermal insulation applications are generally manufactured with a washable black or grey PVC coated nylon fabric. Acoustic Curtains for use in sound insulating applications are generally manufactured with a Black acoustically transparent glass cloth fabric. Other fabric finishes, including your own printing and colours are available subject to enquiry and minimum order quantity. Note! These acoustic curtains are not suitable for domestic use. Acoustic Curtains are widely used in a variety of vehicle applications including the engine bay and chassies of buses, earth moving equipment, forklift trucks etc. 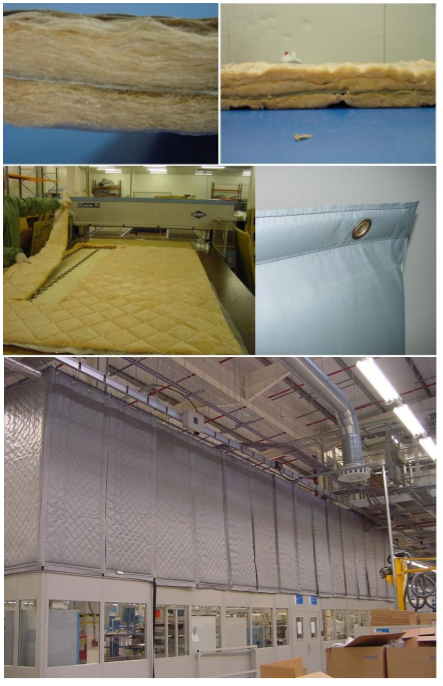 It is also used in industry as acoustic enclosures and screens for the reduction of noise from pumps, fans, compressors and vacuum units. We have found a use for this product in the agricultural and farming industry used in farm buildings to compartmentalise large open spaces. This facilitates the creation of different temperature zones within a space, thus enabling fresh produce to be packed or stored in optimum conditions within each growing season. Acoustic Curtains are also used in underground railway stations to create a barrier to noise travelling up stairwells and escalators during refurbishment works and on construction sites to control noise breaking out and disturbing neighbours in the surrounding environment. As well as blocking sound they can help reduce the volume of dirt and dust migrating between different work areas. temperature within a building ranges from -20ºC to +30ºC. temperature within a building ranges from 0ºC to +200ºC.